National/Pacific Powers to Lead, Holds On for 11-7 All-Star Victory. The National/Pacific All-Stars won the 2010 All-Star Game on July 28th at San José Municipal Stadium. (Photo by John McCauley). The National/Pacific All-Stars powered their way to an early 9-1 lead at San José Municipal Stadium before hanging on to beat a rallying American/Atlantic All-Star squad, 11-7, in the 2010 SJMSBL All-Star Game. Cubs(18) pitcher Joey Kies gets his second straight All-Star Game start. (Photo by John McCauley). Joey Kies(Cubs-18) started his second straight All-Star Game with another impressive outing giving up no runs and striking out two in the top of the first. Kies struck out Casey Neale(Giants) and got Michael Hernandez(Astros) to pop to short before giving up a lone single between short and third to Kraig Constantino(Tigers). Kies closed out the inning catching Ben Hartshorn(Red Sox) looking at a called third strike. Jon Norris(Astros) got the start for the National/Pacific All-Stars in the bottom of the first. Norris started strong as Ray Hutchinson(Royals-18) watched strike three. Norris plunked Lonnell "L. C." Chattmon(Yankees) but catcher Ben Hartshorn came to the rescue shooting down Chapman trying to steal second. Norris closed out the inning with his second strikeout getting one past Brian Pino(Reds-18). Tigers first baseman Kraig Constantino rips a single in the top of the first. (Photo by John McCauley). The top of the second saw the first scoring of the game. Derek St. Louis(Mariners) took the mound for the American/Atlantic All-Stars and immediately put himself in a predicament walking Matt Marks(Tigers). St. Louis then threw a wild pitch to Greg Hancock(Astros) moving Marks to second. Hancock dropped a single into left off the glove of a diving left fielder moving Marks to third. Dominic Bejerano(Braves) hit a dribbler to the first baseman who threw out Hancock at second while Marks was scoring from third. St. Louis hurt himself again by walking Collin Conroy(Brewers) and giving up a base hit up the middle to Steve Bertolacci(Indians) loading the bases. The National/Pacific All-Stars scored their second run when the second baseman dropped the front-end of a double play at second, scoring Bejerano and putting Phil Scholz(White Sox) on first with a fielder's choice. St. Louis got the second out of the inning striking out James Steinle(White Sox). The reprieve was short, though, as Blue Jays slugger Guy Giuffre smashed a groundball base hit up the middle scoring Conroy and Bertolacci. St. Louis finally got out of the inning as Bubba Cordeiro(Braves) watched strike three. National/Pacific takes a 4-0 lead. Fred de Young(Blue Jays) took the mound for the National/Pacific All-Stars in the bottom of the second. Ryan Becks(Royals-18) led off the inning with a deep fly that was run down by left fielder Matt Marks, saving de Young from giving up a potential double. de Young got John Culbertson(Rays) to fly to right for the second out, but then walked Clayton Toller(A's-18) and Django Whittington(Mets-18) back-to-back. Fortunately for de Young he settled down by striking out Jamal Jackson(Cubs-18) to end the inning without giving up a run. National/Pacific All-Stars lead 4-0 after two innings. Eric Pini(Royals-18) got off to a shaky start in the top of the third giving up a double just inside the third base line to Kevin Angelinovich(Red Sox). After throwing a wild pitch that moved Angelinovich to third, Pini settled down to strike out Cliff Hall(Indians) and Micah Taylor(Padres). Pini was back in trouble filling the bases by walking Troy Marcyes(Brewers) and Nick Caravelli(Giants), but once again settled down striking out Mike Sly(Blue Jays) to end the inning, stranding three runners. The American-Atlantic All-Stars finally got on the score board in the bottom of the third. Andy Sanchez(Red Sox) was on the mound for the first of his two innings of work. Jim Greco(A's-18) got the ball rolling with a double off the left-center field wall and moved to third as Sanchez threw a wild pitch to Chris Conroy(Orioles). Greco scored the only run of the inning on Conroy's ground out to second. Sanchez got Danny Ruberte(Reds-18) to ground to first. Chris Graves(Rays) smashed a base hit up the middle, but Sanchez stifled the short rally when Jeff Jovel(Pirates) grounded out to third. National/Pacific All-Stars lead 4-1 after three innings. After giving up a run, the National/Pacific All-Stars decided they'd better get back on the ball in the top of the fourth. Mike McBain(Pirates) was on the mound and was immediately rocked for back-to-back doubles by Mike Smith(Giants) and Casey Neale — Neale's double scoring Smith. Neale moved to third when Michael Hernandez dropped one in front of the center fielder for a single. Hernandez stole second and Neale and Hernandez scored on Kraig Constantino's double down the third base line. The scoring continued as Constantino scored on Ben Hartshorn's single to center. Micah Taylor came in to run for catcher Hartshorn and stole second. McBain finally got the first out of the inning when Matt Marks popped to short. Greg Hancock drilled a deep fly to left for the second out, moving Taylor to third. Taylor scored when Dominic Bejerano grounded to short and the shortstop threw the ball in the dirt and it got past the first baseman. Bejerano moved to second on the error. McBain finally ended the inning getting Collin Conroy to pop to short. National/Pacific scored five runs to make the score 9-1. Andy Sanchez was on the mound again for his second inning of work in the bottom of the fourth. Drew Pleasant(Mets-18) started the inning flying out to center. Steve McLean(Cubs-18) then blasted a double off the left-center field wall. Greg Cohen(Yankees) drove home McLean with a smash up the middle for an RBI single. Kevin Mosely grounded to short for a double play putting a quick end to the rally. National/Pacific All-Stars lead 9-2 after four innings. The fifth inning was rather uneventful for both teams. Joe Bata(A's-18) was on the mound in the top of the fifth and struck out Steve Bertolacci swinging and Phil Schloz looking to start the inning. Andy Sanchez slipped in a single between center and right before being forced at second on James Steinle's fielder's choice. The bottom of the fifth was just as quick for new pitcher Paul Codiga(Braves). Neil Homer(Mariners) flied to left, Max Childress(A's-18) popped to first, Chris Rains(Orioles) drilled a line drive up the middle, and the inning ended on Michael Chagoya's(Yankees) ground out to second. National/Pacific All-Stars lead 9-2 after five innings. Michael Hernandez(Rays), on the mound for the American/Atlantic All-Stars in the top of the sixth, was the victim of a temporary defensive meltdown in what had been a pretty clean game. First baseman Max Childress started it off by dropping Guy Giuffre's pop foul down the first base line giving Giuffre a second life. Hernandez ended up walking Giuffre and then moved Giuffre to second when he threw away a pickoff attempt past Childress. Hernandez then wild pitched Giuffre to third. Childress, at first, got the first out of the inning catching Bubba Cordeiro's pop foul, however, Giuffre tagged and scored from third when no one was covering the plate. Hernandez got out of the inning getting Angelinovich to ground to third and Hall to pop to first. National/Pacific 10-2. The American/Pacific squad countered with their own run in the bottom of the sixth. Joe Duran(Padres) was on the mound. Ray Hutchinson started the inning with a ground out to second. Chapman then smashed the ball up the middle and off Duran's glove. An alert Conroy at third picked up the ball and threw Chapman out at first. Duran then got himself in trouble walking Brian Pino. Ryan Becks dropped a base hit in no man's land between second, center, and right moving Pino to third. Pino then scored on a passed ball and Becks moved to second. Culbertson ended the inning with a grounder back to Duran. National/Pacific All-Stars lead 10-3 after six innings. The National/Pacific put up their final run in the top of the seventh. Brian Siefert(Orioles) was on the mound. Micah Taylor started the inning with a base hit between third and short. Troy Marcyes dropped a single to right-center moving Taylor to third. Caravelli popped out foul to first for the first out. Taylor tagged and scored on Mike Sly's fly to center. The inning ended on Joe Duran's fly to left. National/Pacific 11-3. The bottom of the seventh saw the start of the American/Atlantic rally. Craig Jones(Tigers) was on the mound. Clayton Toller reached on an error by the third baseman. Django Whittington reached on a fielder's choice as Toller was forced at second. Jamal Jackson hit a high popup that dropped in short left moving Whittington to second. Jim Greco hit a short popup that dropped in front of the shortstop and was cutoff by the third baseman who flipped to second forcing Jackson. Greco stole second. With two outs, Whittington on third and Greco on second were moving when Siefert hit a short fly to left that was booted by the left fielder. Whittington and Greco scored closing the gap to 11-5. Danny Ruberte walked, moving Siefert to second. Chris Graves hit a rocket off pitcher Jones for a base hit. Jones was stunned and in pain, but remained in the game to finish out the inning by striking out Jeff Jovel with a high inside pitch. National/Pacific All-Stars lead 11-5 after seven innings. 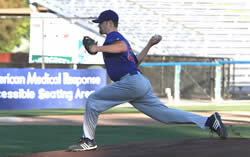 Brian Feduk(Mets-18) threw a quick 1-2-3 top of the eighth. Paul Codiga grounded to second, Fred de Young hit a first pitch grounder to first, and Casey Neale popped to the shortstop to finish Feduk's eight pitch inning. The American/Atlantic squad scored their final runs in the bottom of the eighth. Jay Loughran(Indians) was on the mound and started the inning by walking Drew Pleasant. Steve McLean knocked in Pleasant with a double off the left field wall. Greg Cohen walked putting runners on first and second. McLean stole third and Cohen moved up to second. McLean scored on Kevin Mosely's groundout to short. The American/Atlantic squad had a chance to score a third run on Neil Homer's base hit to left but Cohen was shot down at the plate by a great throw from left fielder Matt Marks. Max Childress hit a liner up the middle for a base hit, but Chris Rains flied to right to end the rally. National/Pacific All-Stars lead 11-7 after eight innings. Stephen Thompson(Reds-18) threw the top of the ninth starting with a walk to Michael Hernandez. Hernandez was forced at second as Kraig Constantino reached on a fielder's choice. Ben Hartshorn popped out to second and Matt Marks finished the National/Pacific offense for the night watching a called third strike. The bottom of the ninth went out with a whimper. No miraculous rally as Mike Smith(Giants) dominated on the mound getting Michael Chagoya to strike out, Ray Hutchinson to fly to center, and finishing off Lonnell Chattmon with a strikeout to end the game.